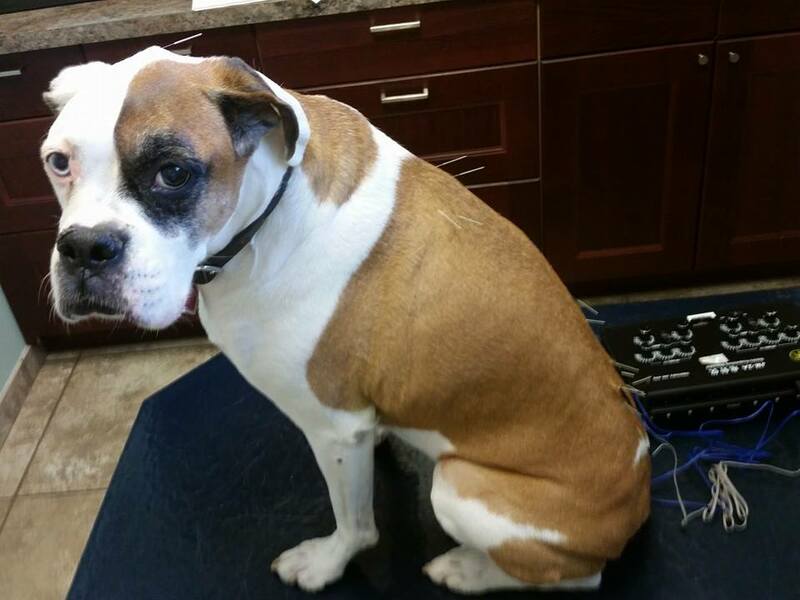 Vicenza the boxer receiving acupuncture for hip dysplasia. Vicenza was unable to jump into the car. After receiving acupuncture she is now able to jump into the car again. Emmie receiving acupuncture for arthritis. Emmie was not jumping up on the counter and was limping on her front leg. A few hours after her first acupuncture treatment Emmie started jumping up on the counter again. Acupuncture is the stimulation of specific acupoints along the skin of the body involving various methods such as the application of heat, pressure, or laser or penetration of thin needles. It is a form of complementary and alternative medicine and a key component of traditional Chinese medicine TCVM. Acupuncture can treat a range of conditions, though is most commonly used for pain relief. How long does each treatment take & How many treatments are needed? Each session may take 20-60 minutes. Many cases will notice a difference the same day or a few days later. Usually a series of 3 to 10 treatments are needed to resolve chronic problems. Some conditions may need monthly maintenance treatments. The most common conditions we treat include musculoskeletal conditions such as hip dysplasia, ACL / cruciate ligament or patellar problems, arthritis, intervertebral disk disease, spinal fractures in bunnies, and degenerative myelopathy (DM). We also treat many pets with allergy symptoms including itchy skin, rashes and ear infections. 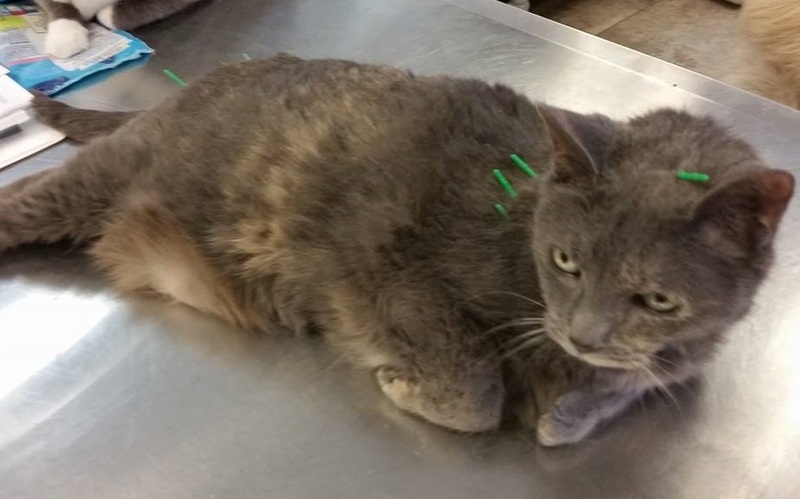 Acupuncture is a useful alternative to keeping your pet on chronic pain medications. The pets pictured in the photos above are not on any traditional medications, yet their arthritis and hip dysplasia symptoms improved with acupuncture treatment alone. Acupuncture can also be combined with traditional medications successfully to treat many conditions. Bunny receiving acupuncture for arthritis. 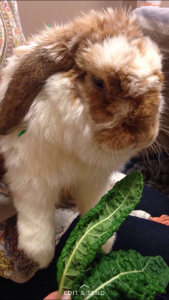 Acupuncture is very successful for bunnies with chronic pain, arthritis and spinal fractures. We also recommend herbal therapy in addition to acupuncture. Herbal medicine utilizes natural herbal ingredients in particular combinations or formulas to treat particular disease patterns. Herbal supplements contain plant based ingredients that have therapeutic properties. Herbs can act as natural and safe pain relievers, cough suppressants , immune boosters and more! We will detail the wonders of herbal therapy in another post soon! For any other questions or to schedule an appointment for your pet’s acupuncture treatment or herbal therapy please give us a call or send us an email! This entry was posted in Uncategorized and tagged acupuncture, acupuncture arthritis, acupuncture bunny, acupuncture cat, acupuncture dog, acupuncture fracture, acupuncture pain, acupuncture rabbits. Bookmark the permalink.